Renderings show an updated B Concourse. 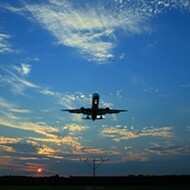 On Wednesday, officials will kick off the three-year construction journey to modernize the Memphis International Airport (MEM). The massive project will consolidate all airline, retail, and food and beverage businesses into the airport’s concourse B. It will bring wider corridors, moving walkways, larger boarding areas, higher ceilings, increased natural lighting, more concessions, and seismic upgrades. All of that comes with a price tag of $245 million, according to August numbers from the Memphis and Shelby County Airport Authority (MSCAA). None of the funding for the project comes from any local tax coffers. The re-design was necessary, airport officials say, because air service at MEM has shrunk. Three concourses and 80-plus gates made sense when Memphis was a Delta hub. Now that it’s not, a single concourse will house enough gates for flights, and put passengers in close proximity to gates, food, shops, and bathrooms. It will also allow airplanes to move more easily in and out of gates, allowing for more-efficient air service. When it opens, Concourse B will have 23 gates. Those gates can handle about 3 million emplacements (people getting on or off airplanes), which is about 50 percent more traffic than MEM has now. If authority officials land more flights to and from MEM (as they do on the regular), B Concourse can handle 15 more gates that’ll be able to handle 5.5 million additional enplanements. When it opens, B Concourse its expected to look like modern airport concourses in other cities. High ceilings, glass, and wide corridors will create a modern, airy space for passengers. There will be new and better food and retail options. 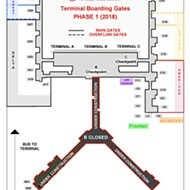 Ticketing and check-in will continue in the A, B, and C terminals. Baggage claim for all airlines will be consolidated into the B baggage claim. Though, A,B, and C baggage claim will be open for entry and exit. Security screening will be largely consolidated to the B concourse but the checkpoint at C will remain open for heavy traffic. Concourse B closed earlier this year. And, after tomorrow's groundbreaking ceremony, Flintco workers will get to work (maybe they already are). While that work is underway, everything — gates, food, shops, and all — will operate out of A and C Concourse. When the work is done, everything — gates, food, shops, and all — will move into the new and modern B Concourse. Once that's done, the south end of Concourse C will be demolished to make it easier for planes to move in and out of the airport. Got more questions? Go here.